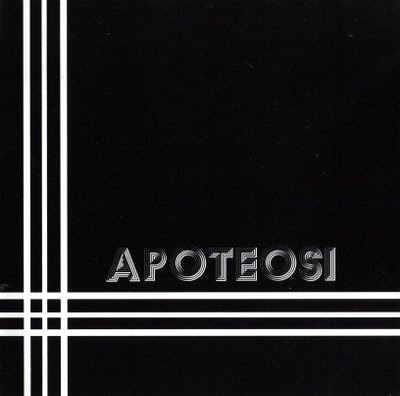 Apoteosi is one of those Italian bands that one would tend to gloss over in light of the slew of excellent releases from that country, and understandably so. The band plays symphonic progressive rock with many of the usual characteristics; piano, flute, beautiful melodies, and a tendency to sound like PFM at times. Add that to the fact that the album came out in progressive rocks downswing, 1975, and is really not as highly touted as, say the Quella Vecchia Locanda or PFM albums, a conclusion could be drawn that a certain wannabe connoisseur of Italian prog (read: me) might have clean overlooked this album until just recently. Not surprisingly, it's actually really damn good. Thankfully, this Italian one shot has enough distinguishing qualities to make it a necessary purchase for any serious collector. Most obviously, Apoteosi features a full time female vocalist, who is quite nice, though her vocals certainly don't make or break the album. More importantly, the band has a slight hard rock/psych sound at times, with fuzzed out electric guitar solos, plenty of organ and moog, as well as thick, consistently intriguing basslines that tie the proceedings together nicely. Of course, these portions are always set against other, quieter segments that are more typically Italian, for better or worse. Piano and flute melodies create beautiful backdrops for the female vocalist, who generally chimes in when things settle down, allowing the instruments to carry the melodies when the band chooses to crank up the intensity. Recorded at studio SONIC(Rome) in February 1975.